Sign Up To Sell Avon Online --> Startup kits cost start at just $25.! Sign Up To Sell Avon here on my Secure Online Sign Up Page! You can start selling Avon as soon as your Avon Start Up Kit arrives! Sign up to sell Avon Online Kits starting at just $25.! You can Join my Avon Team from anywhere in the USA! I am a National Avon Sales Leader, I have well over 150 Avon Representatives on my Avon Sales Team. Sign Up To Sell On my Avon Sales Team and get full Support to get Started at NO additional Cost! Avon has been hard at work over the last few years making becoming an Avon Representative more fun, and even more profitable! The compensation plan includes a higher payment on product sales than before. Avon Representatives also now enjoy a higher earnings level while selling online via the Avon Online e-store. Avon Representatives who have started to build a sales team also enjoy a higher level of earnings from each representative on their team! Avon has also seriously began improving support for online selling. Avon Representatives have a full library of social media images, and tools to help with social media posts. In short, it's never been a better time to sign up to sell Avon! And I am here to support you too! Earn Real Money Selling Avon - And Have Fun Too! Selling Avon can earn you a few dollars a month, or enough to quit your day job and be an Avon Representative Full Time like me! You get out of it what you put into it! It's very true! I wanted to be a Full Time Avon Representative from the start, so that's what I worked towards. But, I know some Reps, and helpers, that just want to do Avon Part Time, and that's ok too. There is the potential to make as much as you need, or as much as you want. Push to the earnings level you want to be at. And have FUN ! 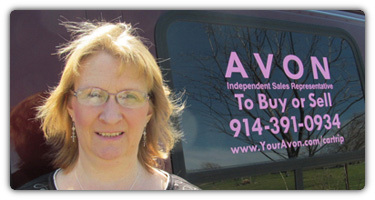 I earn trips from Avon, and I go to many Avon Events and love meeting people. My Customers light up my day, so every day as an Avon Representative is a Great Day For Me ! Is this something you might like for yourself? Well then Sign up to sell Avon on my team, and lets earn so money! I do NOT sell my Support NO DVD's to buy, NO Books to buy. Sign up to sell Avon With me and get started Earning in just a few days ! Sign up here or go directly to my Secure Avon Online Sign Up Form if you are having trouble with this page. Any questions please call me ! ~ Thank you for Signing up to Sell Avon With Cindy! Below is the official Avon.com Become An Avon Representative Sign Up Form. Thanks for joining my team! Sign Up To Sell Avon Quickly and Securely using this form. Avon has been quietly making Moms, Women, and a few men money for over 130 years! Leader, You Can Sign Up To Sell Avon with me - I can get you started, give support, I do NOT Sell Support, NO DVD's to buy, No Book to buy, you get my support for FREE on my team! Sell Avon and Earn Real Money! Selling Avon is Fun and rewarding! Selling Avon is one way to gain financial independence! Sell Avon Online too! Using the Avon e-Store as part of your Avon Account!